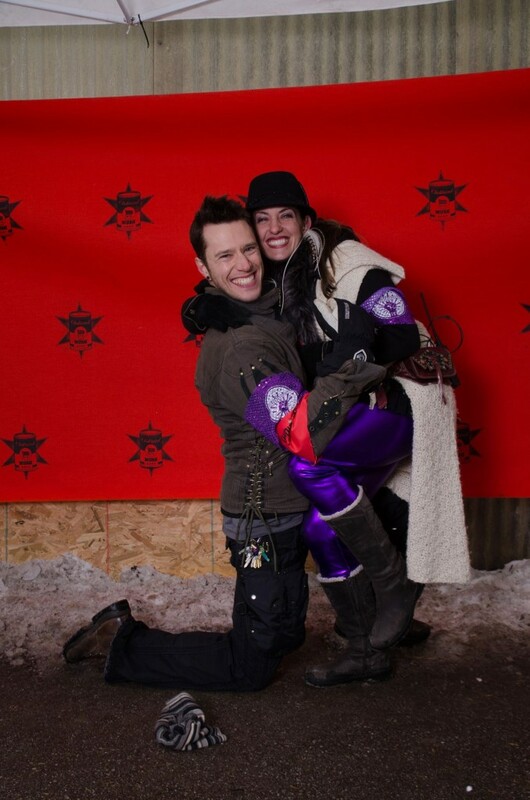 CHIditarod’s First Couple Devin Breen and Liz Campanella. Seriously, you can’t say “No” to people this awesome. I originally got suckered enticed into helping my friends at Edible Alchemy Foods serve breakfast to the hundreds of event volunteers and racers. And when I say breakfast, I mean a full breakfast, with hot bacon, sausage, pancakes, scrambled eggs, coffee, juice and all the fixings, all made on site at their outdoor mobile kitchen. It probably also had something to do with the fact that thanks to my involvement with the Chicago Full Moon Jams, I’d gotten to be good friends with the event founder, Devin Breen, and his wife Liz Campanella (Liz is one of the FMJ founders) and they are the kind of people who it’s really hard to say no to because of their enthusiasm and passion for bringing together talented and amazing people from all walks of life to create vibrant communities. I really enjoy seeing such an explosion of creativity and community spirit from so many diverse people, no matter how cold, snowy or wet the day of the race is (CHIditarod’s policy is that “there’s no such thing as bad weather, just poor clothing decisions”). After nine years, CHIditarod’s become an annual event that people look forward to – ask those who are old hands at the race and they’ll tell you they spend the whole winter preparing, building their carts, costumes and fundraising because they believe in the camaraderie and using creative passion to help those in need. CHIditarod’s managed to raise over 80K lbs of food and tens of thousands of dollars for charity, so it’s something I’m proud to participate in every year. Plus, it’s a hell of a good time. However, after three years of dragging myself out of bed at a ridiculously early hour on a Saturday and dealing with freezing feet no matter how many layers of socks I wore under warm boots, I was ready to try something different. The first Saturday of March in Chicago is consistently cruelly cold. Since joining the Chicago Nerd Social Club’s Board of Organizers a year ago (funny enough, my first meeting as a board member was on the same day as CHIditarod VIII), I’ve been scheming to get CNSC involved in the event. 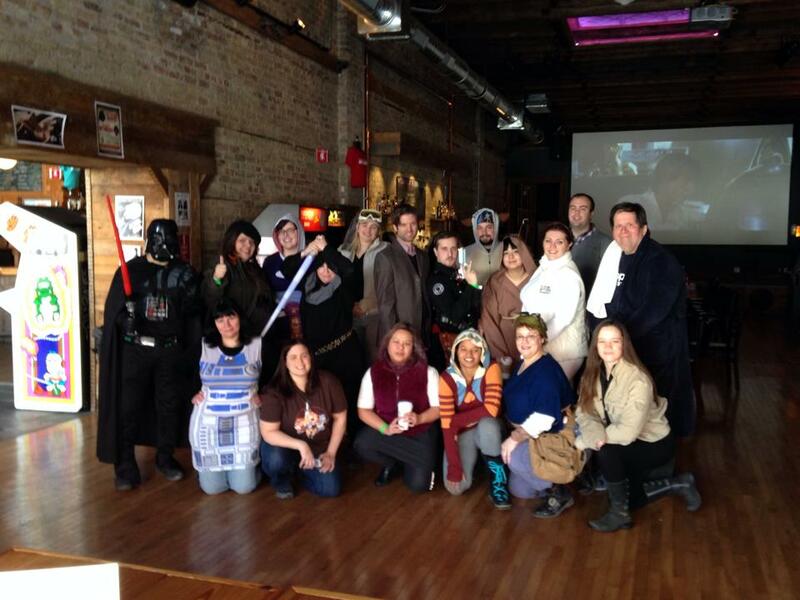 The Chicago nerd community is filled with people who use their nerdy passions to contribute to charities and philanthropic missions. Not to mention there always seems to be a really high number of nerdy/geeky themed race teams that come through CHIditarod every year. Given all that, getting CNSC involved in the event didn't seem like such a far-fetched idea. On March 1, 2014, twelve hundred women, men, gladiators, spies, flight attendants, greasers, highlanders, bananas, knights, and enthusiastic mushers gathered on a brisk 17F degree morning to create the annual spectacular costumed charity shopping cart race and epic mobile food drive — CHIditarod IX. 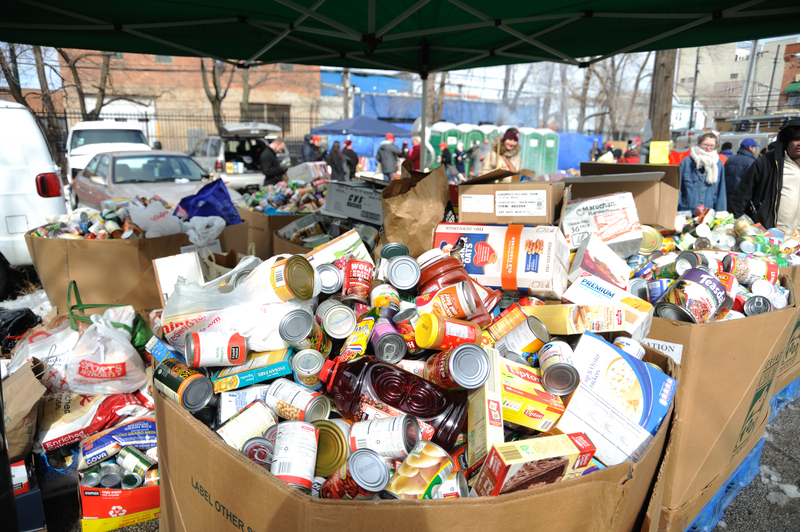 The mercury never rose above freezing, yet that failed to dissuade nearly 400 volunteers and 150 teams of 5 heavily-costumed humans from raising food and funds to fight hunger in Chicago while racing tricked-out shopping carts through 5 themed checkpoint establishments on the frozen streets of Chicago. This is CHIditarod. CHIditarod's Core Organizers. Some of the most dedicated passionate people I've ever worked with. I'm often critical of the geek and nerd community's short-comings because I know we can be better than the regressive Old Guard yelling at clouds. I believe in the potential for nerds and geeks to truly be the positive and progressive force our community claims to be. It's terribly frustrating and sometimes downright soul-crushing to see how easily some corners of the geek world fall into discriminatory exclusion, an unwillingness to empathize with others and outright dismissing problems unless it directly affects them. For all the steps forward geeks and nerds have taken to improving things, the stumbling and back-tracking sometimes makes me despair that we'll ever actually get anywhere. Which is why the stress and hard work that went into running the CNSC Checkpoint at Emporium Arcade Bar (really, we couldn't have asked for a better location), was without question, worth it. The enthusiasm, dedication and creativity I saw my fellow CNSC Checkpoint team members pour into this event precisely because it was helping others, reminded me of all the reasons why I love being a geek and being around other nerdy, geeky people. Here was a group of 19 self-proclaimed nerds and geeks, many of whom had never met each other before and maybe interacted a few times in the CNSC Facebook group, who put aside personal differences, rolled up their sleeves and threw themselves into the event because they wanted to make a difference. And what we accomplished together was amazing. When I think of the best that nerds and geeks have to offer, I need only point to the generosity, eagerness to help and good cheer of my teammates. I can't express how proud and lucky I feel to have been part of what CNSC created and contributed to CHIditarod IX. CNSC raised a good amount of money for the CHIditarod Foundation, but more than that, we showed that nerds can and do participate in communities outside of their own and can be a wonderful, positive force when we do so. We are a community of artists, leaders, do-gooders and we know how to have a good time while working for a good cause. So to my fellow CNSC teammates - Michelle Benedicta, Holly Blessen, Michael Brugioni, Danette Chavez, Raquel Chavez, Jennifer Cross, Sondra de Jong, Gordon Dymowski, Mark Graunke, Mary Ann Grossman, David Hansen, Renee Ismail, Jesse Lex, Marc Nobele, Anne Petersen, Beth Voigt, Jorie Von Ohlen and Wendy Zdrodowski - from the bottom of my heart, thank you for all your hard work, for enduring the Hoth-like cold while wrangling carts and racers, and putting up with my stressed-out self. You guys exemplified everything that makes me proud to be part of our nerdy community. CHIdtarod's 10 year anniversary is a year away, but it's never too early for nerds to start planning. 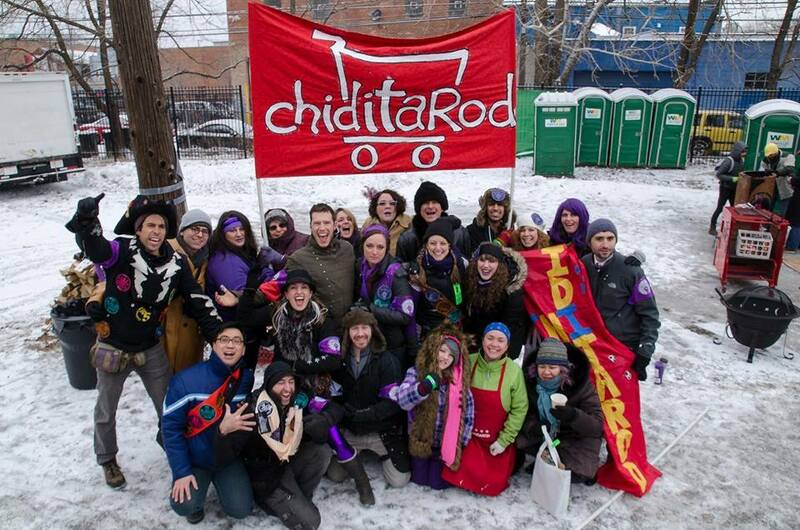 I can't wait to see what we're going to come up with for CHIditarod X, but I know it will be epic. So whether you're interested in racing, volunteering with the event or joining the CNSC Checkpoint team, mark your calendars for Saturday, March 7, 2015. This entry was posted in Event and tagged charity, Chicago Nerd Social Club, CHIditarod, CNSC, food drive, fundraiser, Greater Chicago Food Depository by Michi Trota. Bookmark the permalink.